The Droid Bionic has finally arrived. At $300 with a two year contract, the Bionic brings together 4G LTE service, a dual-core processor, a large screen, and Android 2.3.4 Gingerbread. Here’s the low-down on why those features look great for doing business. Network: This is a Verizon phone, using their new 4G LTE network. If you’re used to 3G, 4G will be almost 10 times faster. That means far less waiting time when accessing data. Note that for an extra monthly fee, you can also use the Bionic as a mobile hotspot, allowing you to connect up to five devices via Wi-Fi (be careful, you can eat up your data plan very quickly at 4G speeds.). As far as coverage, Verizon has 4G available in 116 major cities, with five more by mid-September providing coverage to more than half of the population. If you’re not in a 4G city, you’ll likely still get tried-and-true 3G coverage. Processor: Speed doesn’t stop at the network, as the Bionic has a dual-core, 1GHz Texas Instruments OMAP4430 chipset, the same used in the BlackBerry PlayBook tablet, which PCWorld tests confirm makes running apps snappy. Memory: Although early Droids contained only 512MB--and only half of that was available for apps--the Bionic has 2GB of ROM, providing plenty of room for Android 2.3.4 and a bunch of apps. With that and 1GB of RAM you’ll also be able to have have a bunch of those apps running at the same time, should the need arise. For data storage it comes with 16GB of built-in, and a 16GB MicroSD card that's upgradable to 32GB, giving you the potential for 48GB of music, video, and any other data you desire. Audio/Video: You’ll need that space if you’re out taking photos or 1080p HD video with the 8-megapixel camera. There’s also a front-facing camera which allows you to video conference with your colleagues. Combine that with a Bluetooth headset and you’ve got a great communication device for important meetings, even when you’re on the road. Screen: The Bionic has a 960x540, 256 PPI pixel density, 4.3-inch anti-reflective touchscreen made of scratch-resistant Corning Gorilla Glass. It’s not a tablet, but it’s large for a phone, and will make both reading and writing more enjoyable than the typical small phone screen. It also uses a qHD 16:9 display ratio so it will fit HD video without having to add black bars to the image. Despite the great specs, PCWorld editor Ginny Mies found the screen to be disappointing, with blurry images and a grid of dots being visible. Location: If you’re traveling without your Garmin or TomTom, the Bionic's built-in aGPS/sGPS use satellite and radio towers to find your location. Combined with an accelerometer and e-compass the Bionic can guide you to your destination. Battery: Powering all of this is a 1735 mAH battery that is said to provide 650 minutes of talk time and 200 hours of standby time. Early reports suggest that your battery will be consumed much quicker if you’re using 4G, so whenever you’re near Wi-Fi you’ll want to use it for large data transfers. You can expand your phone to serve as a cross between a tablet and a laptop by adding the $300 LapDock, an 11.6-inch display with keyboard and trackpad that you can plug your phone into. This option was also available for the Atrix 4G, but even though the two docks are very similar, they are not compatible. If you drive often, there is also a vehicle dock available, allowing you to more easily interact with the phone with one hand, and keep it charged and visible while navigating. When you get home, the Bionic's built-in HDMI can connect to your big screen to play video. You can use the optional HD Station, a dock that connects to your TV, to make this even more convenient if you do it often. One rumored feature that didn’t make it into the Bionic is a GSM radio that would have made it a "World Phone". If you head overseas often, depending on which countries you visit, this may not be the best phone to roam with. 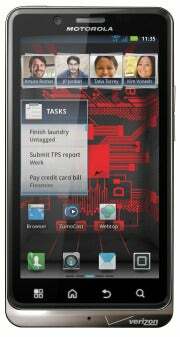 If you don’t already have a smartphone, the Droid Bionic is perhaps the most business-ready phone available. Its fast networking, dual-core processor, 1GB of RAM, large screen, and available LapDock should appeal to those who find themselves on the road often. For many, these options could replace a tablet or even a laptop. Its only apparent shortcomings are that the Bionic is not a great phone for roaming (see the Atrix 4G as a similar AT&T alternative), the display isn’t as sharp as the specs would suggest it should be, and you may need to charge it mid-day if you’re using the 4G network often (stay tuned for more PCWorld testing). If you can live with that, then the Droid Bionic appears to deserve a place in your workflow. Joseph Fieber is an experienced blogger who spent 25 years as an IT pro, and has a background in computer consulting and software training. He can be contacted through his website, JosephFieber.com.